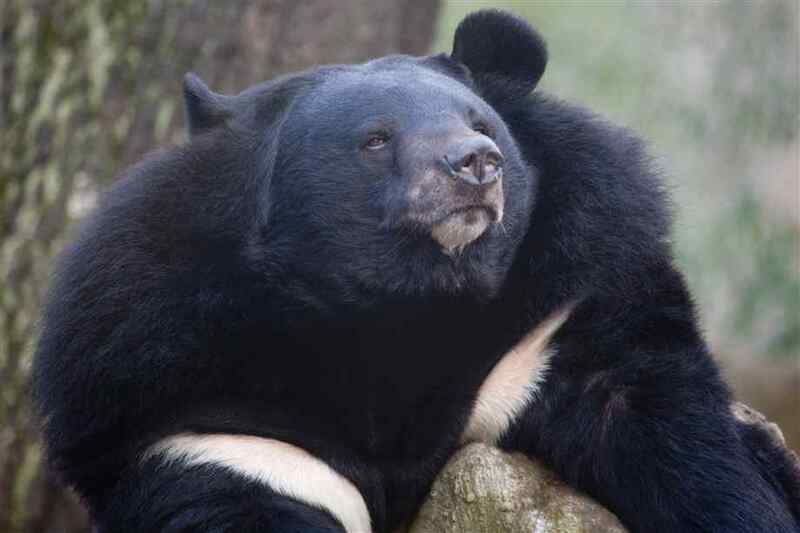 Asian black bear aka the white-chested bear and moon bear is a species of medium-sized bears characterized by a sturdy frame, round head, and rough coat. Although their appearance is similar to brown bears, the black Asian bears have a lighter body, slender limbs, larger nose and lips, smaller skull, and a larger jaw. Their bell-shaped ears are longer as compared to those of their relatives – the American black bear and the brown bear. Although these are diurnal animals, they often become nocturnal when living near human inhabitations. 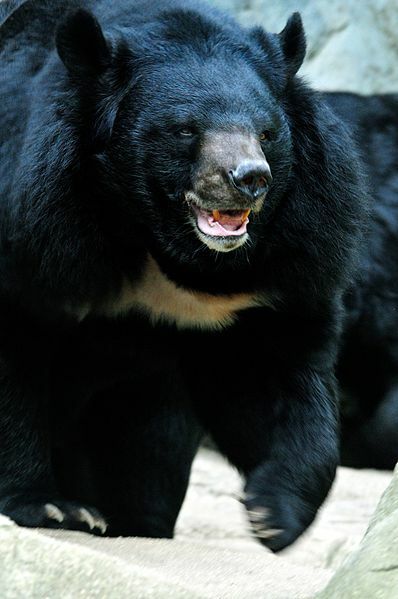 Asian black bears are primarily solitary though some may live in groups containing adults and their cubs, moving in an orderly manner starting from the largest to the smallest. 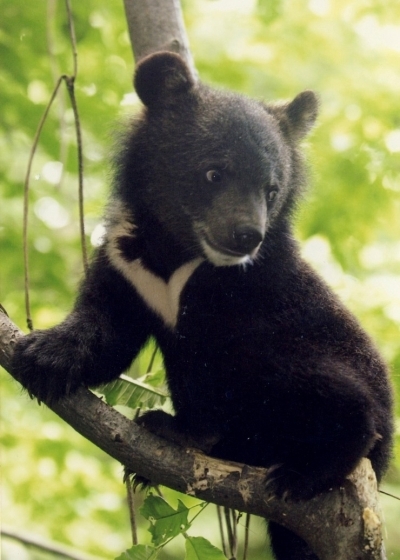 The black bears are adept at climbing trees and rocks, and they do so to rest, eat, evade enemies and hibernate. When feeding on a tree, a black bear will break the twigs and branches and place them underneath to create a nest-like structure, which is used for resting for short durations. 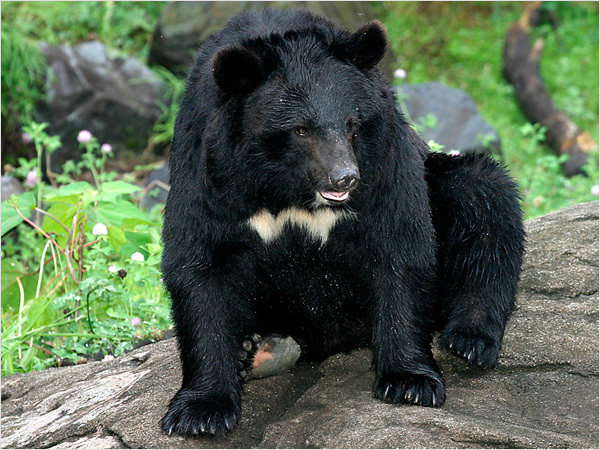 The Asian black bears use caves, holes, hollow trees/logs, or mountainous slopes as their dens where they sleep from November-March as well as give birth in winter or spring. 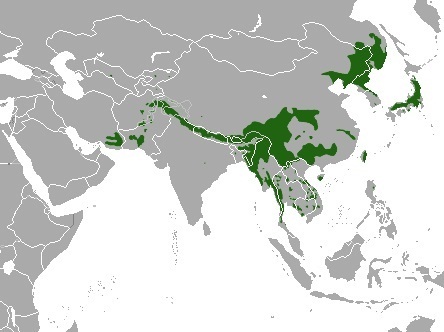 The Asiatic black bears have a polygynandrous mating system, meaning a female bear forms a breeding pair with more than one male, which also pair with many females. They have delayed implantation, and after the gestation period, the females give birth in mid January-February. 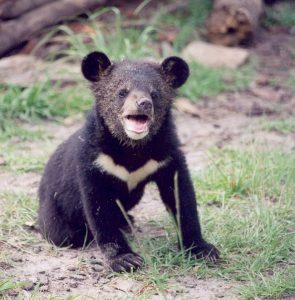 The skull of a newborn black bear is similar to that of a sun bear. 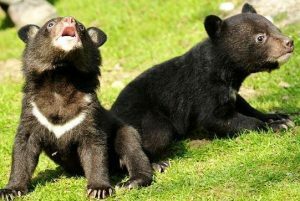 The newborn cubs weighing around 13 ounces, start walking at 4 days though they do not open their eyes until 7 days of age. 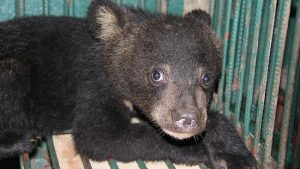 Since they mature slowly, they weigh only 2.5 kg at 3-4 months of age. Even though the cubs are weaned at 3 ½ months, they remain under their mother’s care for 2-3 years. The juvenile bears reach sexual maturity at 3-4 years. 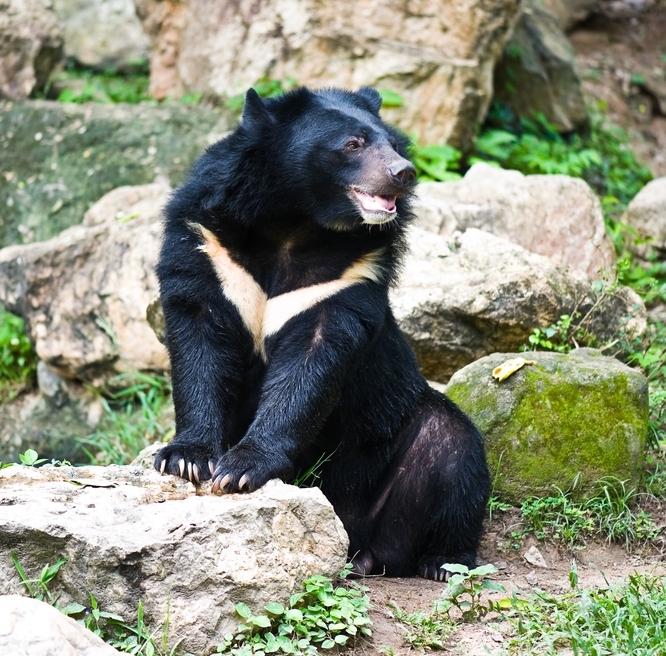 Among all bear species, the Asian black bear is the most bipedal. 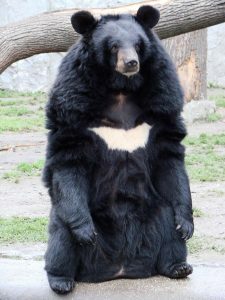 It can walk in an upright position for more than a quarter mile. Though they have poor eyesight and moderate hearing powers, their sense of smell is more acute as compared to that of brown bears. 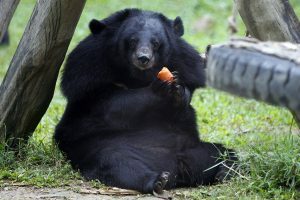 The gallbladders and bile of these black bears are harvested in some East Asian countries to produce medicine that help in reducing inflammation and fevers. The biggest Asiatic black bear that has been officially measured, reportedly weighed 440 lb (200 kg). 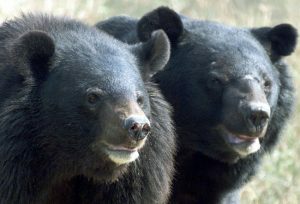 These black bears are capable of producing hybrid offspring because of their reproductive compatibility with other bear species. 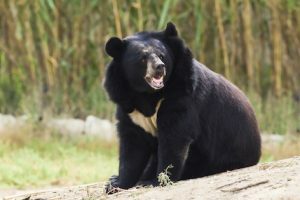 They eat a number of different types of high calorie foods, and store the excess fat for use during hibernation in the winter months when food is scarce. 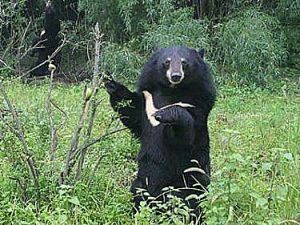 Published on May 7th 2016 by admin under Coniferous Forest Animals. 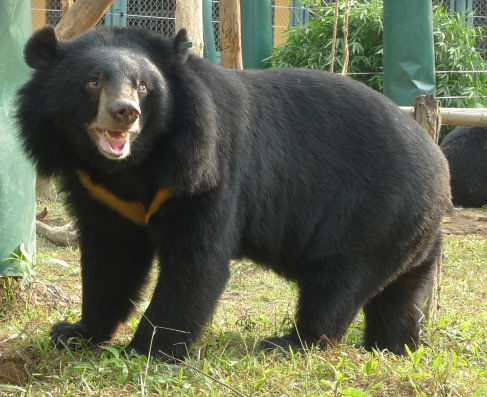 Article was last reviewed on 7th May 2016.